Keele University scientists have discovered a road created by the Knights Templar after the recent heatwave exposed the long-hidden foundations. The prolonged hot, dry weather this summer has been a boon to archaeologists across the United Kingdom as the outlines of ancient structures have been revealed by patterns in the growth of grass and crops. Scientists in the School of Geography, Geology and the Environment at Keele University have taken the opportunity to fly one of their research drones above the Keele campus and the surrounding area to map out these parch marks and look for any historical features, and their explorations have revealed some unexpected images including the outline of the 13th Century medieval road into Keele village. The drone images reveal part of the medieval road from Newcastle-under-Lyme entering Keele village as a broad brown stripe across a field where the crop root growth is restricted by the drier and more compacted former road surface. Keele village was founded as a centre for the Knights Templar when the land was given to the order in the 1160s by King Henry II. After the demise of the Knights Templar in 1308, the ownership eventually transferred to the Knights Hospitaller and it remained in their hands until the Reformation and the dissolution of the Hospitallers in 1540. The site of the Templar chapel is believed to be underneath that of the more modern church, but the location of the Temple Preceptory, or administrative building, and other buildings of the Templar Keele village are still unknown. 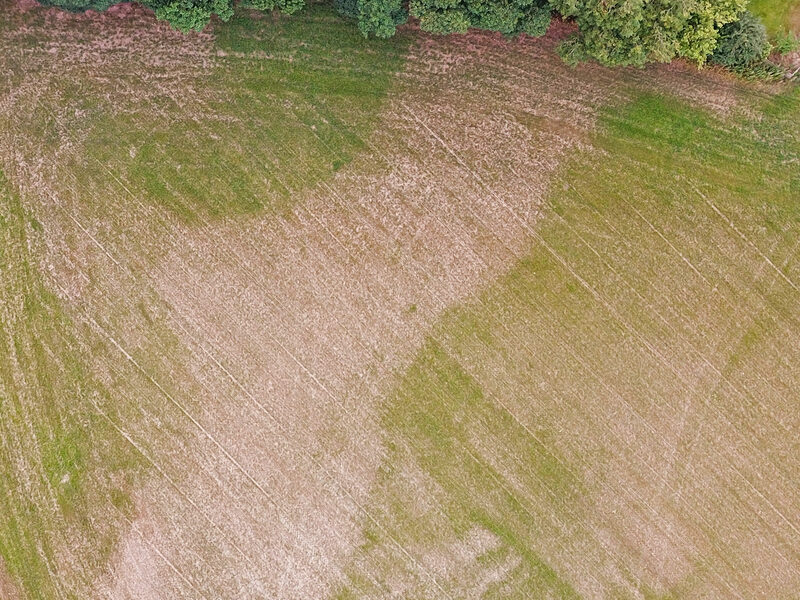 The drone survey hopes to uncover more of medieval Keele from patterns in the parched earth.